I was placed on Levaquin three weeks ago for diverticulitis. I am not able to take an Sulfa drugs so the drug of choice was Levaquin 500 mg. q.d. by the Emergency Room physician after an abdominal CT scan. After the 6the day on the Levaquin I woke in the middle of the night with severe shoulder pain (right and left), knee pain and hip pain - where I actually could not run over in bed. Upon arising in the AM after a fitful nights' sleep I was unable to left my arms more that 4 inches in the air. Being a nurse, I immediately called my primary care physician who informed me to stop the Levaquin, which I have absolutely no intentions of ever taking again. He told me not to do anything and drink plenty of fluids, rest and not even climb any stairs in fear of a ruptured Achilles tendon. After thinking about my past history of shoulder pain and shoulder surgery 5 years ago....I then realized that I had been put on Levaquin 6 years ago for a bout of diverticuliti as well. I remember having some muscle pains but never correlated the two. A year later I was diagnosed with a ruptured bicep tendon (unknown cause ???) which I had surgically repaired only to end up having a full thickness tear of the rotator cuff 5 weeks after surgery. The left shoulder has never really be the same - decreased ROM and loss of strength and weakness in that arm. Now I am dealing with pain yet again in the left shoulder and a feeling of my right shoulder slipping at times and feeling like I may get a subluxation. I have pain throughout the day and intense at night. I am thinking of seeking an Orthopedic consult but I am hoping that there is something less invasive. I really believe that this damage is definitely from the Levaquin. What you describe sounds like the familiar results of Levaquin. So it's a bummer you were given a super powerful and bad-side-effect carrying antibiotic instead by doctors that don't know how to effectively treat diverticulitis. But we're at where we're at. Levaquin causes massive magnesium depletion (which causes muscle pain/problem and/or mental/physical anxiety symptoms) and kills of mitochondria in the connective tissue. It does a bunch of other stuff but that's a couple of the prime movers of the mechanism. So tendons hurt, and can and do fall apart. Muscles hurt. The whole system gets thrown far out of whack and then you're stuck in a pain dynamic. And it's not like normal damage, where you get a cut, for instance, and then it heals. It's more like you get a cut, and your body is literally unable to heal the cut because the system has been depleted and disrupted and can't bring itself back to optimal so can't heal. Hopefully you're in the category of people that, by default, get better (within) in a year or so. But if you're in the category of people that, by default, never get better, I highly suggest you kick yourself into high gear doing things that help bring your body back towards optimal. Thus I suggest The Levaquin Tendonitis Solution ebook. There are a LOT of things that won't help your situation. This includes anti-inflammatories, corticosteroids (DON'T do those), physical therapy, any particular pharmaceutical drug, massage (lowers pain levels), prolotherapy, acupuncture (potentially helpful but not a fix), chiropractic (potentially a little helpful, potentially very harmful), etc. Rest won't cure anything, but it takes load off the structure so prevents tearing damage...but if somethings going to tear, it's going to tear. So you want to avoid that of course, and replete your body so it can heal strong enough before any more tears happen. Feel free to update (or use the Forum that comes with the ebook). I did purchase the e-book and I have increased various nutrition as suggested. I am not consumed with the pain throughout the day and have a little more ROM in the shoulder. I was NOT aware of the gluten free diet for diverticulitis but I guess that is going to be the next plan....being a nurse I have shared this information with other nurses, PA's and NP's. I will continue to follow your plan as I can see it working already and it has only been one week. I am a 56 yr old woman that went to the dr for a diverticulitis pain. I rarely have this pain..maybe twice in the last 10 yrs. I was prescribed and I started on a 500 mg once a day dose of levaquin. I took it for two weeks. In the middle of the second week my left achilles tendon and my left shoulder began to ache. I stretched the tendon on my leg and it quit hurting within a week after my doses were done. The shoulder still hurts. That was on 1/30. It is now 2/25 and my shoulder still hurts badly. I am not sure if I should rest it or stretch it. Put ice on it or heat. I have been stretching and putting heat on because that seems to make it feel better. It hurts constantly and especially at night when I lie down. I have been calling my drs office for two weeks and keep leaving voice mails. So far no one has gotten back with me except once last week. she left me a voice mail and wanted me to call and explain my symptoms and I did that. She said in her voice mail they had to find the dr. and find out what I should do. That was last week and still no one has gotten back with me. I have not spoken with a live person but have been leaving voice mails. The dr had warned me that there were rare instances of tendon damage but that he had only heard of two but if I experienced this to let him know. I will keep on putting on heat, taking nsaids and aspercreme trying to help this pain. Hopefully it will go away soon. It wears me down having this constant pain. I often complain that doctors don't spend 10 minutes a month keeping up to date on their field. If you doctor had, he'd know that Levaquin side effects are a big deal. I hope your doctor eventually got back to you, though I'd be VERY surprised if you were told to do anything other than rest, take anti-inflammatories, etc. Unfortunately, the doctor has nothing is his tool bag that can fix fluoroquinolone side effects. Please don't take any corticosteroids. They're bad news with Levaquin, Cipro, and the other fluoroquinolone antibiotics. Hopefully time will make the symptoms go away, but I wouldn't bet any money on it. Levaquin depelets your body of necessary nutrition (at best). Until that gets replaced, you body can't recover. If you have diverticulitis, you're not getting all the nutrition from your food, not that food these days is rich with nutrition. See Magnesium For Tendonitis as a starting point for that conversation. How are you doing now, and what have you been doing for self care? Why the time lapse or was there? I can trace levaqin and cipro etc prescribed back to 2008 then 2010 and every year thereafter. I have 5 different tendon tears, and one inflamed Achilles' tendon. They began in 2014. Why the delay? Also I have been diagnosed as bipolar, double vision, memory loss, problem with balance, speech problem. I am not a an athlete. Why is it that it took so many years before symptoms started? And how do I differentiate between diseases that are caused by Cipro etc. and those that are not.? "Why is it that it took so many years before symptoms started?" 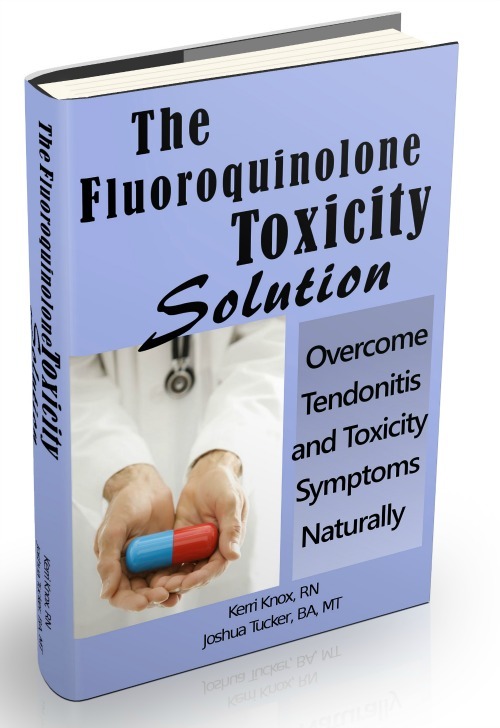 It's a little different for everyone, but essentially, one of the primary results of fluoroquinolone interaction in the body is nutritional deficiency, magnesium being a big one. The body can sometimes keep going for a while before you feel it, but basically you get kicked off a cliff and it takes a while before you hit ground. Nutritional deficiency isn't the only possible factor, there's also mitochondrial kill off, and that can happen fast or build up over time. "And how do I differentiate between diseases that are caused by Cipro etc. and those that are not.?"